Hello ABS-ers! Hope you are having a great August. I am busy, busy, busy - today is day 16 of my 23 day craft fair, in the Edinburgh Festival. Phew! As you can imagine, I'm pretty shattered, but I'm also thoroughly enjoying the experience - I'm surrounded by other lovely stall-holders, and on the most part, the weather has been good to us! It's amazing how quickly you fall into the routine of these things. I can tell I will miss it when it is over, although I'll be glad of a little down time. Already planning a little escape for a few days, once it's all over! 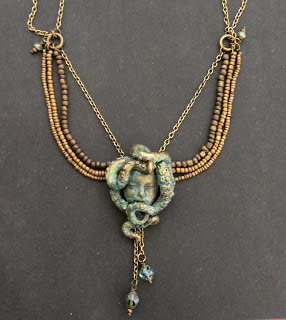 This week, I have a really striking piece of jewellery to share with you from Saraccino, which features an amazing bead which she created herself. You can read all about it over on her blog, here. 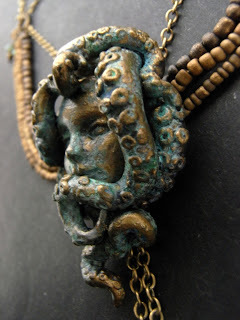 As always when I see talented people do things with polymer clay, I am totally in awe here! A stunning bead, and necklace. We also had a couple of shares from Karin, featuring her bead embroidery work. Some more beautiful pieces - do take a minute to go and check them out! Here and here. Thanks so much ladies, for sharing your beautiful creations! And here's a themed bead I found on etsy, from Bo Hulley Beads. 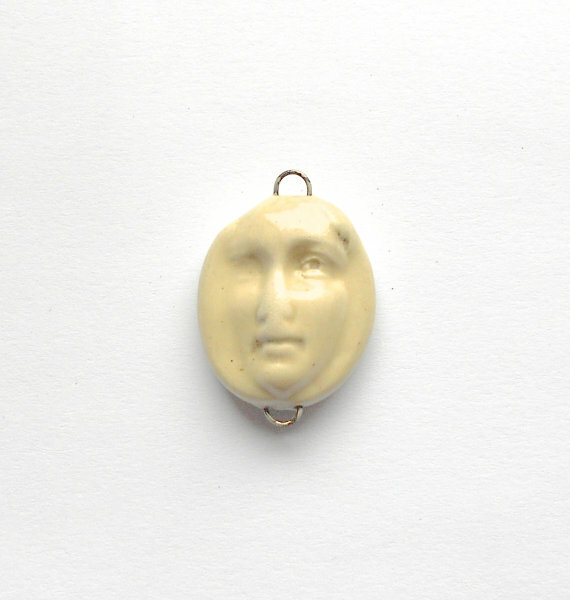 There's something almost a little ghostly about the impression of this face...I can see some really atmospheric jewellery being created with it. And now for the Bead Blogger Links. Happy Sunday, everyone! Check out Erin's big news - she will be presenting a webinar on Fibre Findings and Finshing Techniques for Jewelry for Interweave/FW Media! Jean reviews the 10th Anniversary Collector's Issue of Bead Style Magazine and it is GREAT! See Jean's blog! Thank you for showing my necklace :) This bead ("She") as well as the necklace, the whole project, has a deep personal meaning for me.